Americans and the press always seemed to have a love-hate relationship. Despite much of the anti-media rhetoric at play within the national dialogue, a fairly good chunk of Americans (72 percent) trust the information they receive from national news organizations, according to the Pew Research Center. The good news is more Americans are engaged. That means more eyeballs on traditional media, and social too. In fact, Pew also reported in a recent survey that two-thirds of Americans (67 percent) say they get at least some of their news from social media. Conflict and human interest is what makes news. And in today’s highly competitive 24/7-news environment, getting the proverbial scoop is going to be good for both the journalist and their respective outlets. So, when Hurricane Harvey rolled around, it’s no surprise that millions watched live coverage of the category three-storm barrel through the Gulf Coast. Homes being destroyed and acts of heroism provided much needed drama that kept viewers engaged. It’s hard to say how far a journalist will go to get a good story. Many correspondents are often confronted with ethical dilemmas of interfering with their own reporting. Veteran journalist Will Bunch touched upon this topic in a recent op-ed, The Day the ‘Enemies of the American People’ Helped Save America. 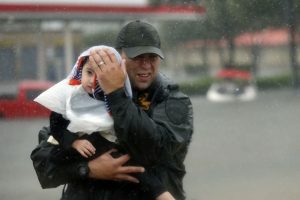 The Philadelphia Daily News reporter wrote about those media who set aside their reporting to help rescue victims of Hurricane Harvey, while responding to repeated criticism of the press. The fact is media are people, too. They have friends and families and experience life’s challenges just like everyone else. No doubt the media landscape has changed dramatically. News outlets now cater to liked-minded audiences, fueling the country’s already tumultuous divide. While it’s easy to complain about the press, just think about what America would be without it.